Join AIA Baltimore and AIA Baltimore Emerging Professionals for their annual masonry workshop. This workshop allows you to work side-by-side with experienced masons. You’ll learn how to: mix mortar and lay-up brick and block mock-up walls; construct window openings and corner conditions, and learn about installation of through-wall flashing, tiebacks, mortar net and weep holes. The Maryland House and Garden Pilgrimage (MHGP), a non-profit organization, is dedicated to the preservation and restoration of architecturally significant properties in the State of Maryland. The Pilgrimage has remained constant with this purpose since its formation in 1930. Pilgrims are given the opportunity to visit and tour unique houses and gardens spread out across the state of Maryland. The Spring 2019 tours will take place in Charles County, Queen Anne’s County, Baltimore City, Baltimore County, and Carroll County. The first site in Charles County is Stagg Hall, 8450 Commerce Street, Port Tobacco, MD 20677. Cromwell Valley Park Council, Inc. invites you to their lime kiln dedication ceremony on Sunday, April 28, 2019 from 11AM to 1PM at the Cromwell Valley Park Willow Grove Entrance at 2175 Cromwell Bridge Road. A brunch will follow at the Merrick Log House. 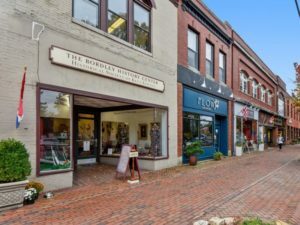 Preservation Maryland will host a preservation pop-up office at The Bordley History Center in downtown Chestertown on Friday, May 3, 2019. The public is encouraged to visit the pop-up office anytime between 10AM and 4PM to speak with a member of Preservation Maryland’s professional staff about their historic preservation and historic property questions. No appointment is needed.